Some exile Tibetans are angry with Sikyong candidate Lukar Jam Atsok for criticizing HH’s policies. He has not only been attacked in speech and writing but also on video, in one of which the accuser bursts into tears and dramatically sobs out his condemnation. A specific accusation against Lukar is that he once talked about His Holiness as “la-gyen” or the “old lama”. Of course, this is not the usual way to refer to the Dalai Lama, and it is not exactly respectful, but on the other hand it is also definitely not hostile. One might even say Lukar’s la-gyen reference is affectionate, in an informal sort of way. Like Englishmen (of yesteryear) calling each other “old boy” or “old chap”. Of course older Tibetans would say that Lukar Jam was being too forward, in a socially inappropriate way (nangtsa tsa drapa), and perhaps they have a point. But we should bear in mind that Lukar Jam does not come from the honorific filled world of old Lhasa, or the “culturally subservient” world of exile Tibetans where children are trained from infancy to sing nursery rhymes in praise of His Holiness. Lukar Jam was a nomad boy from Chabcha, playing with sheep, and probably singing paeans to Chairman Mao in his local elementary school. 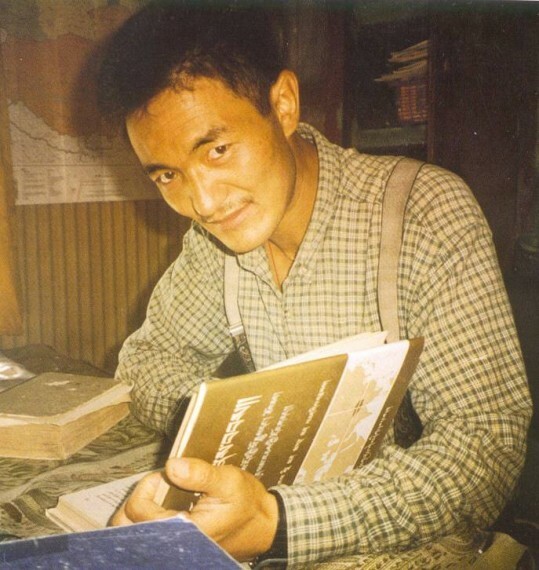 We should also never lose sight of the fact that after his first escape to India in 1991, Lukar Jam returned home to Amdo with as many copies of the Dalai Lama’s My Land and My People as he could carry, a videotape of a speech the Dalai Lama made when he accepted the Nobel Peace Prize in 1989 and human rights documents including some sixty copies of the Universal Declaration of Human Rights. It was very dangerous thing to do but Lukar explains: “I carried the books and videotape home because people, especially older people, wanted to see the Dalai Lama. They often prayed they would see him in Tibet. I knew the books and tape would bring happiness to them. Tibetans don’t know about the Universal Declaration, and I thought that if I distributed copies it might help them to understand.” Perhaps Lukar’s critics should ask themselves if they had ever taken such a risk on the Dalai Lama’s behalf? Lukar Jam was arrested a year later, for this and for other crimes against the state. The Haixi Intermediate People’s Court sentenced Lukhar Jam to an eight-year term for “espionage” and ten more years for “organizing and leading a counterrevolutionary clique.” The full account of Lukar’s and his friends Tsegon Gyal and Namlo Yak dangerous undertakings for the cause of Tibetan freedom is in the detailed Human Rights Watch report I have linked here. For those few exiles spreading the rumor that Lukar was arrested for stealing a yak, it should be pointed out that CTA-backed Tibetan Center for Human Rights & Democracy at Gangchen Kyisong (TCHRD) in their publication of November 1997 caries a Profile Article “Sentenced to 17 Years for Espionage” which makes it clear that Lukar Jam was charged with “endangering national security”, and being a spy for an “external espionage organization” (almost certainly the Tibetan government in exile). In prison he underwent unceasing and relentless interrogation, sleep deprivation, starvation rations, painfully tight handcuffs and leg shackles, and endless beatings “I was beaten and tortured with every kind of technique. They used cattle prods. My body swelled so much that my pants tore when I tried to put them on, but they didn’t give me new ones.” Lukar was soon seriously ill and rapidly lost weight. His abdomen became painfully distended and he developed a serious lung disorder. After four years in prison he was clearly dying. The prefectural hospital told the high court that Lukhar Jam was beyond their help, and there was no hope of him recovering. The chief of the detention center refused to take responsibility if Lukar Jam died in prison. After much nightmarish bureaucratic wrangling he was granted medical parole, if his family paid all his medical expenses. Lukar was in prison for fours years. When he was finally released, he could not stand, much less walk, unaided. He weighed 37 kgs (81 lbs). This is somewhat better than Holocaust survivors, whose average weight was around 60 lbs. The Americans who survived the Bataan “Death March” and Japanese POW camps, the “walking skeletons”, were said on average to weigh about 90 lbs. The above photograph was taken a few months after he had put on a little weight. When someone posted it on Facebook one idiot commented that the photograph was faked because the face and neck looked darker than the body. I posted a reply where I noted that in such photographs the face and neck are usually darker as they are more exposed to the sun than the torso which is usually covered with a shirt or jacket. Someone else remarked that Lukar Jam’s imprisonment had happened a long time ago and that he and his supporters should get over it. Lukar himself does not talk much about his prison experience. If you’ve listened to his campaign speeches you’ll note that he practically makes no reference to it at all. I think I know why. These days when trendy liberal types in the West talk about overcoming tragedy and loss, they insist on using the facile word “closure.” Whether it’s the death of a loved one, a national catastrophe, or more often than not, a divorce, closure is supposed to be what we need to heal and get on with our lives. But if you survive something truly horrendous, the reality is that there is no such thing as closure. Nightmares never end in the real world. I think it was Choeying la who replied, in a voice so soft that it was barely audible: “Every night when I fall asleep I dream of being back in prison.” My blood ran cold. This is why I feel Lukar Jam would make a good leader. There is no “closure” for him on this most vital of issues. He will never forget what the Chinese did to him, and by extension what they did to Tibet. Samdhong Rinpoche may complain to the Indian press about new-arrivals from Tibet being violent, but I think that new arrivals, especially political prisoners, could make an invaluable contribution to exile politics with their hard-earned experience of suffering under the Chinese. Hence I have no hesitation in saying that it is criminal, I repeat, criminal of CTA officials to try and reeducate (sometimes even pressure) arriving political prisoners in Dharamshala, to give up their commitment to the cause for which they were tortured and incarcerated, and instead adopt and advocate the official policy that Tibet should be part of the PRC. I also believe that Tibetan political prisoners do not merely exist to be trotted around the corridors of the US Congress or the European Union to drum-up more funding for the CTA or ICT; and that our duty to them does not somehow become fulfilled when we sing their praises as “heroes” and arrange an audience or two for them with the Dalai Lama. It is vital for us to recognize that these are individuals, unique individuals with a political vision that most of us in exile have lost a long time ago. It is that political vision and experience, and their courage and commitment to stand up and speak out for it which now makes the likes of Lukar Jam, and also Ngawang Sangdrol, Golok Jigme, Phuntsok Wangchuk, Choeying Kunsang and many other prisoners of conscience the ideal leaders for the Tibetan struggle in this darkest moment in our long history.